Below is a diagram of what may be covered by insurance. We accept PPO plans and Medicare. We are not in network and do not accept any HMO plans, Medicare Advantage Plans, Medical or Kaiser. What is the cost of Regenexx procedures? The diagram below provides typical price ranges for Regenexx Stem Cell and Platelet Procedures and how these procedures may be used to treat different types of conditions. Please see below for what may be covered by insurance. We accept PPO plans, Medicare and TriCare. We are not in network and do not accept any HMO plans, Medicare Advantage Plans, Medical or Kaiser. What kind of conditions will Regenexx procedures be able to help? Most orthopedic injuries, such as arthritic joints, degenerated joint disease, bursitis, meniscal tears, partial and full thickness tears of tendons, muscles or ligaments and lumbar disc bulges. Each patient must be evaluated by one of our physicians to determine if they are a candidate for treatment. Since each patient is different, it is necessary to review imaging studies such as MRI and/or X-Rays of the affected joint/tissue to determine candidacy. If you have an insurance plan that we accept, we will bill your carrier directly. If you do not have insurance, the cash price for an in-office consultation is $295.00. Our consultation includes a complete examination of the area to be treated, review of patient history and imaging studies, as well as an ultrasound of the affected joint. Can I have a consultation without having to see the doctor in person? Yes, we offer a telephone review with the physician once we receive your health history and MRI imaging study. Our coordinators will schedule a time to talk with the physician who will gather all pertinent information and make a recommendation as to candidacy. The telephone consultation is generally 30 minutes and costs $200.00. The $200.00 fee will be credited towards your in-office examination that will need to take place prior to the start of treatment. Is an MRI or CT scan really necessary? Yes. X-Rays will show the physician the bones, but it does not show cartilage, tendons, or ligaments. The MRI / CT will give the physician an in-depth look at the affected joint and help the physician make the best possible recommendation for treatment. What if I do not have an MRI or CT scan? If you do not have an MRI or CT, there are a few different options available. First, you can ask your primary care physician (PCP) to order the imaging studies for you. If your PCP will not order the MRI / CT scan, our physician can order the imaging for you. If you have an insurance plan that we accept, our physician can order your imaging after your initial consultation. If you do not have insurance (or if you have a plan we do not accept), we can order a cash pay MRI / CT scan for you at one of our contracted facilities. No, but we will be happy to review your health history and imaging studies briefly, free of charge, to determine if you are a potential candidate for a Regenexx treatment. If you are a candidate, we can schedule a consultation for you to meet with one of our physicians for a more in depth evaluation. What kind of results could I expect? It depends on the condition of the joint/tissue, age, health history, medications regularly taken and prior surgeries. Our physicians will advise you of your prognosis after examining you, reviewing your health history and imaging studies. We have also posted the outcome data compiled from the Regenexx patient registry. Are Regenexx procedures designed to be an alternative to joint replacement surgery? Absolutely, Regenexx providers have treated thousands of patients nationwide who have been able to avoid having joint replacement surgery. The idea behind the patented Regenexx Stem Cell Procedure is to regrow your cartilage in the joint and actually reverse the arthritic changes. Doesn’t it make more financial sense for me to have a joint replacement? Some of our candidates have elected to undergo surgery because of financial considerations without adequately evaluating the risks of surgery, including general anesthesia, infection, blood clots, poor alignment of the mechanical joint, possible allergic reaction to the metal on metal ions released into the blood stream,long recovery time, and physical therapy costs. On the other hand, patients have compared their out of pocket costs of having a joint replacement with a high deductible insurance plan, and found that their costs are comparable to having a stem cell procedure. My orthopedic doctor told me I'm "bone on bone" and nothing other than a joint replacement can get me out of pain and functional again. Can a Regenexx Stem Cell Procedure treat "bone on bone" degeneration? YES, in many cases the “bone on bone” diagnosis is made on the basis of X-Ray analysis showing a severe reduction of joint space. However, MRI will frequently identify mild or moderate reduction of Articular Cartilage that can be treated successfully with the Regenexx Stem Cell Procedure. 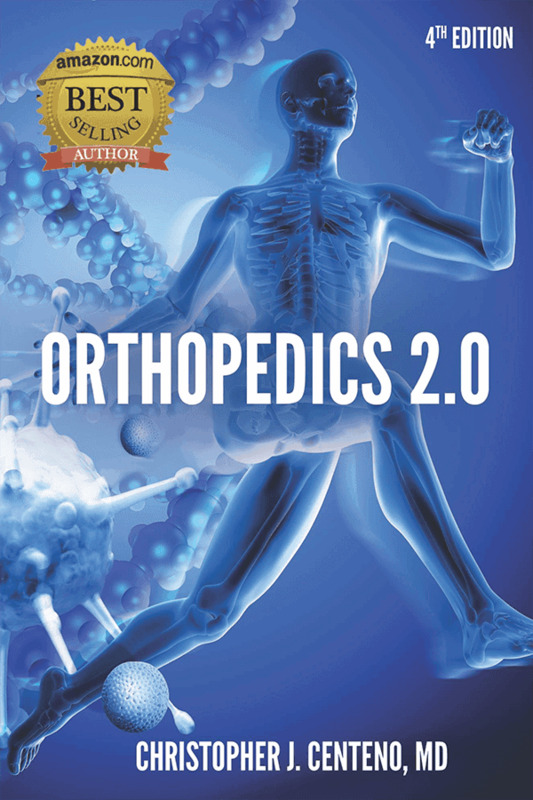 Unfortunately, most orthopedic doctors are not aware of the advances that have been made in Autologus (coming from you) Stem Cell Therapies. Regenexx is the pioneer of orthopedic stem cell therapies and is one of the only companies that offers published results. If I have Severe Arthritis, what kind of result can I expect? Interestingly, our data indicates that the severity of the arthritis was no longer associated with outcome (i.e. patients with more severe arthritis had as much improvement as those with mild arthritis). Does being older have an impact on the result? Regenexx outcome data surprised us as there was no association between age and doing better or worse with the procedure when used for knee arthritis. Regenexx outcome data showed there was no association between overweight and doing better or worse with the procedure when used for knee arthritis. What does that data show when comparing Hip or Knee Replacement Surgery with Stem Cell Therapy? Dr. Mitch Scheinkop, one of our network providers in Chicago and a highly experienced surgeon collected and compared outcome data on the Regenexx Stem Cell Procedure and hip and knee joint replacement procedures. Both procedures produced improvements in reduction of pain and increased function. However, the stem cell procedure produced significantly better range of motion outcomes that can lead to a more normal resumption of sports and other activities. Is this procedure approved by the FDA? This is a medical procedure; the FDA does not “approve” or “disapprove” medical procedures (like gall bladder surgery for example). Medical procedures are performed at the discretion of the practicing physician and their state’s board. What is the difference between the Regenexx Stem Cell Procedure performed in the U.S. and the Regenexx-C procedures? All of the procedures performed throughout our U.S. Regenexx Procedure Network are same-day procedures. This means that the patient’s cells are harvested in the morning, isolated and processed, then re-injected into the patient’s injured area – all within a period of a few hours. The Regenexx-C Procedure, which is only performed at Regenexx Cayman, involves harvesting the cells on the patient’s first visit, growing them to larger numbers over approximately two weeks, testing the cells, then re-injecting the cells during the patient’s second visit. If you would like to learn more about the FDA’s stance on the Regenexx-C procedure, you can download a free e-book here. It’s an interesting, informative and thought-provoking story that is well worth a read (offered through the Colorado office only). What can I expect with the bone marrow aspiration? Despite common belief, 99% of patients do not experience pain with the bone marrow aspiration. The physician will use a local anesthetic to numb the tissue all the way down to the bone. Your bone has no nerve endings, so you should not experience any pain with the aspiration. Most patients describe it as a “vacuuming” or “sucking” sensation. The bone marrow aspiration takes about 1 hour to perform.